Whilst uShaka Sea World Aquarist, Paul Lotter was doing his rounds at the aquarium just after 7am on Thursday morning (December 4th), he noticed that one of their largest female ragged tooth sharks (Carcharias Taurus), Notch, was not as plump as she’d been the night before. Notch became famous two years ago when she gave birth to Storm. It was the first ragged toothed pup birth captured on camera anywhere in the world. Staff noticed that Notch’s girth was expanding again in September and were eagerly anticipating another happy occasion. 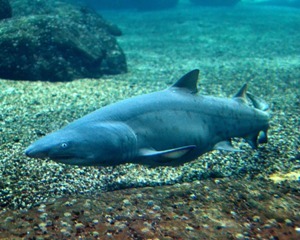 Ragged tooth sharks have the lowest reproductive rate of all shark species and only reach sexual maturity at 7 years for males and 10 years for females. They are classified as vulnerable on the IUCN Red Data List. The delivery was completely unexpected and because December 4th just happens to be uShaka Sea World Director, Tony McEwan’s birthday, it was decided to name the newest baby girl Toni. Although she measures only 70cm and appears tiny and vulnerable alongside the other sharks, Toni is healthy and feisty and is swimming strongly. Newborn sharks make up a sizable portion of the diets of large predatory fish and adult sharks. To make sure that Toni wasn’t on the menu, she has been removed from the tank. She will be closely monitored over the next couple of days. Newborn Raggie pups are independent of parental care and, having outlasted their brothers and sisters in the uterus, are the ultimate survivors. Toni will be on display in her own specially designed exhibit in the Aquarium within a few weeks. For more information, contact Ann Kunz at uShaka Sea World on 031 3288 222.